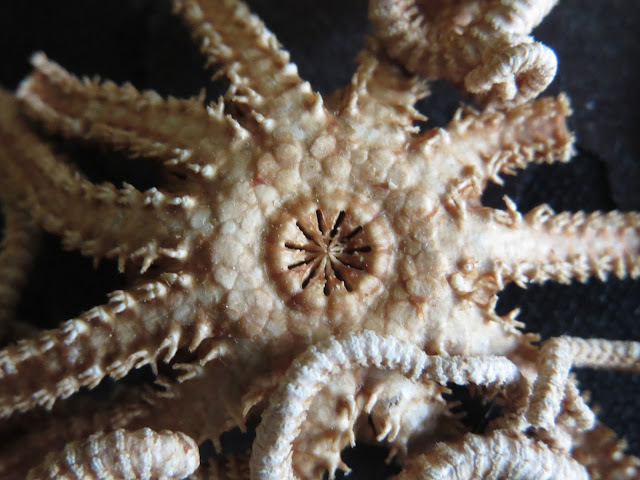 The Echinoblog: Let's Learn About Multi-armed OPHIUROIDS! I've often talked of my love of multi-armed sea stars. BUT brittle stars can have more than five rays (arms) also!! 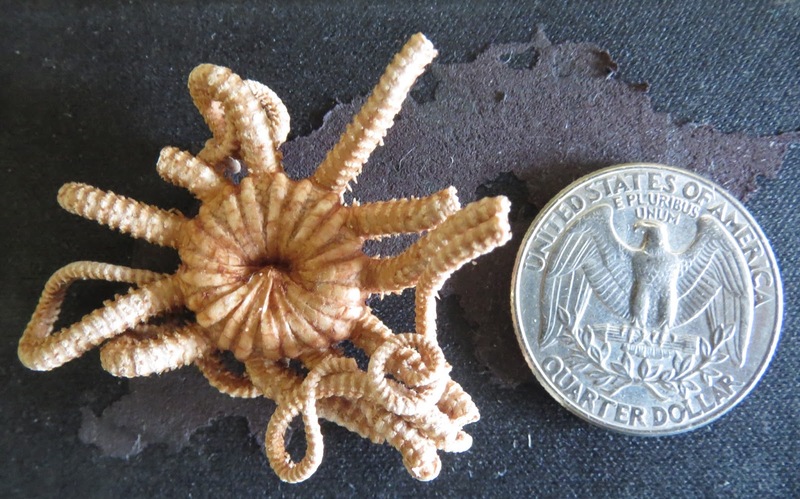 So wait, there are ophiuroids (brittle stars, basket stars, etc.) that have MORE than 5 rays?? 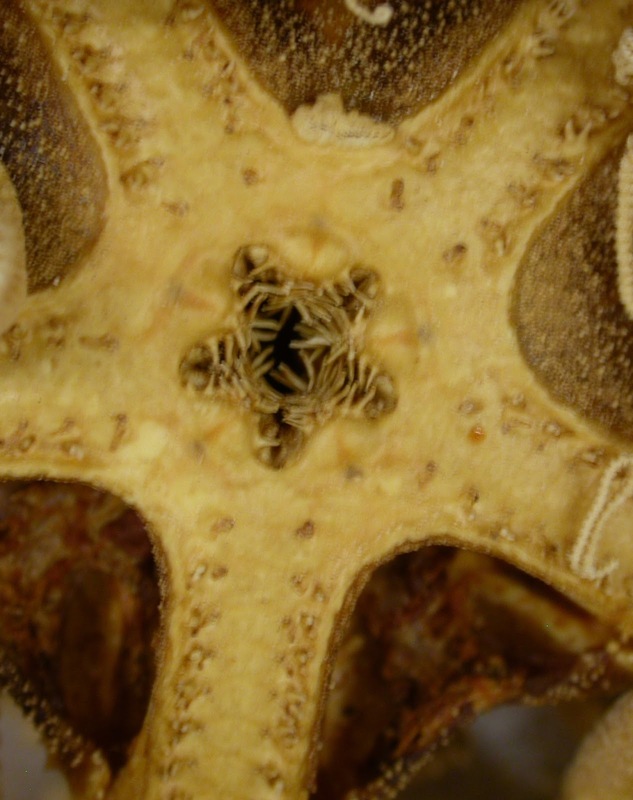 Most sea stars (close relatives to ophiuroids) have 5 rays, but a significant number of them have more than five rays and there are some entire groups of sea stars (e.g., the Brisingida) which are characterized by having multiple arms (six to 20ish). When sea stars have more than 5 rays there tend to be about 7 to 15 of them. But some, such as the Antarctic Labidiaster can have up to 50. What one sees in most starfish species is that multi-armed sea stars tend to be large, highly mobile and predatory. This tropical, shallow water Luidia maculata for example demonstrates all of those qualities. 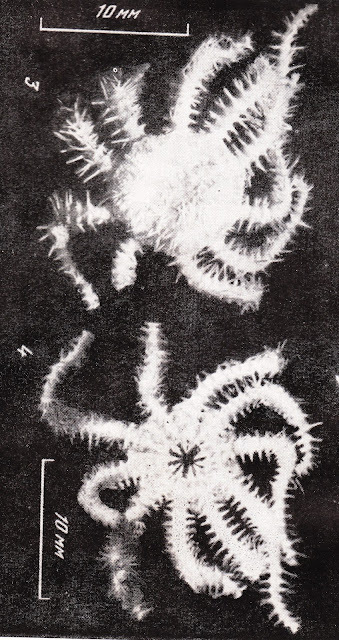 In contrast, Multi-armed ophiuroids have different patterns than what sea stars demonstrate. Ophiuroids tend to be either six to seven rayed or 10 or more. Generally none with intermediate arm numbers (i.e., 8 to 9) and no species are known with more than 12 rays. 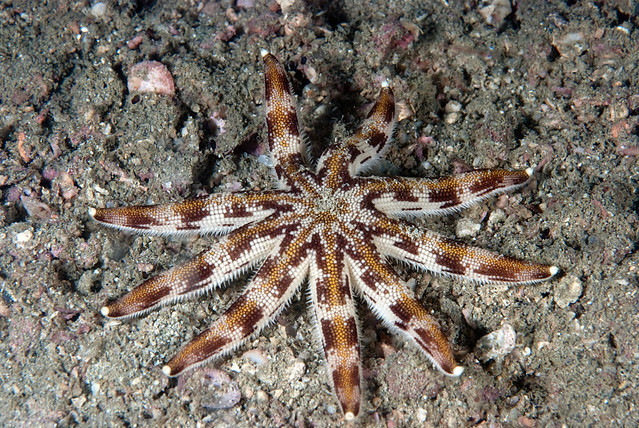 Certainly no 20-50 rayed beasts like the sea star Labidiaster. And as we'll see, there's no apparent ecological association with having more than 5 arms in ophiuroids. 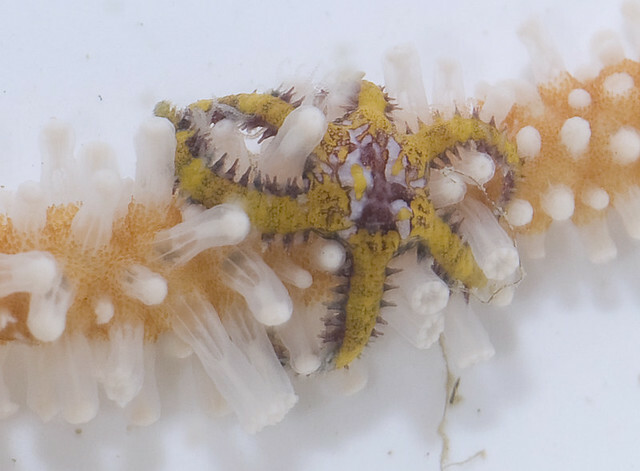 Low numbered multi-rayed brittle star species, those with about six to eight arms are not uncommon and seem to show a fairly diverse range of habitats. But the ones with more than 10 rays are more seldom seen. This one for example is Ophiothela danae. 6 rays. These occur in tropical-shallow water habitats and live with their arms wrapped around the stalks of sea fans and sea whips. Does the sixth arm help facilitate this lifestyle?? This species appears to be successful. It occurs widely in the tropics and has "invaded" the tropical Atlantic from the Pacific. 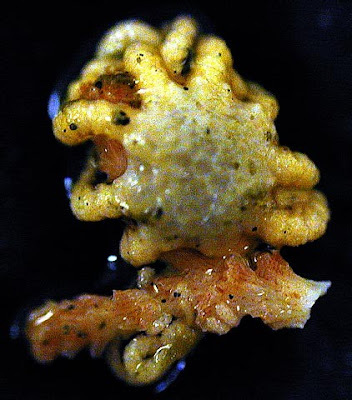 Here is Ophiactis savignyi, a brittle star that reproduces both sexually and asexually (i.e. it divides in half) brittle star which occurs globally all around the world (read more here). Perhaps its sixth arm is part of the asexual condition? Or maybe its cryptic life style? Here is Ophionotus hexactis. Six arms. Adaptive? Predatory? Highly Mobile? An animal I'm not sure much is known about it. But on the OTHER hand, here are some Antarctic brittle stars, such as Ophiacantha vivipara which have SEVEN arms. Its a brooding species (i.e., the adults raise babies on their bodies). Not sure how this benefits the animal. Maybe in feeding? Aids in parental care somehow? Or maybe its just an incidental feature? There are a few more species of ophiuroids that show six to seven arms than I've shown here. But for various reasons (i.e, I either didn't have pictures of them, space, etc) I haven't included them. Several species of serpent stars in the genus Asteromorpha for example can demonstrate six or seven arms. Ophiacantha enneactis & O. decaactis. The genus Ophiacantha, is kind of unusual because it includes several species which possess more than 5 arms (see O. vivipara above). 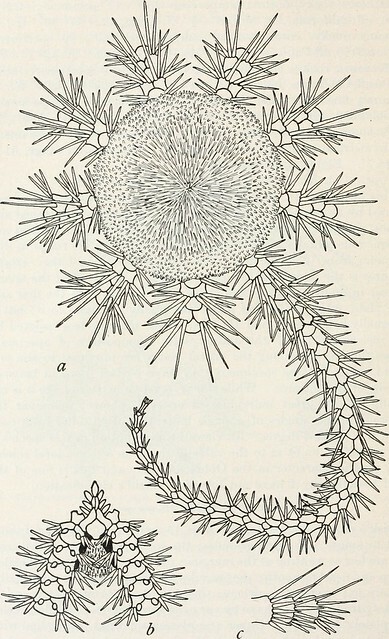 Two of them, O. enneactis (illustration-top) and O. decaactis (below) have been collected from the Aleutian Islands in deep-water. O. enneactis is from 549-881 m. And O. decaactis is from comparable depths. These are similar species and both are pretty small. What they do down there in the deeps with all their arms is "poorly understood." (i.e. we don't know). Perhaps suspension feeding? Predation? 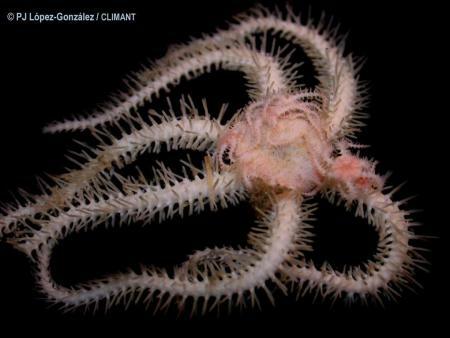 Astrochlamys sol Probably the winner of ALL the multi-armed ophiuroids though is this species: Astrochlamys sol, a bizarre Antarctic form, which is a member of the Gorgonocephalidae, so its actually a modified basket star. 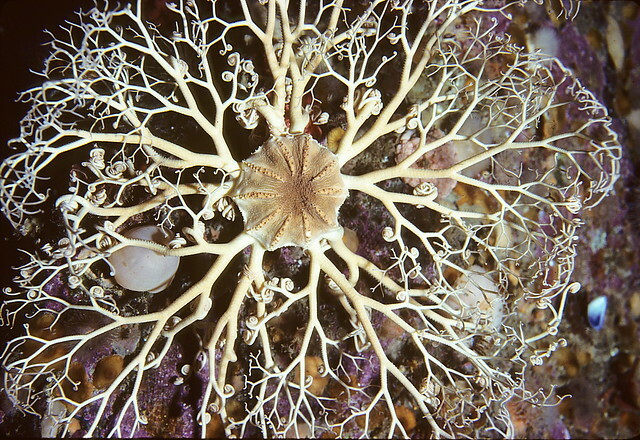 I thought Basket Stars already had more than five arms?? 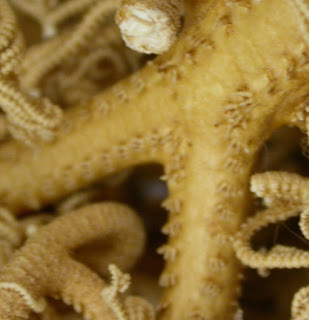 Basket stars are a subdivision of ophiuroids called the Euryalida. They tend to have big, thick arms with fleshy tissue covering over their skeleton. These ophiuroids extend their arms into the water column and usually have hooks or long arms to feed on food or prey as it swims by.. I've written about one particular basket star, Gorgonocephalus here. But there are a fair number of basket stars in cold water and tropical habitats. Below is the underside of Gorgonocephalus, the cold-water basket star from the Arctic/subArctic. Note that only five rays radiate away from its mouth. The arms bifurcate or split for several iterations away from the five primary rays on the disk..
That's what makes A. sol, so unusual. It actually has 10 to 11 arms!! Making it the ophiuroid (not technically a "brittle star") with the MOST number of arms! Its species name "sol" refers to sun, which likely alludes to its arms radiating away from the mouth. On a personal note I'm always fascinated by these forms. Unusual in appearance but also kind of mysterious. What does it do with all those arms? What is so unusual about deep-sea/cold-water/Antarctic species that they have so many arms? Is brooding related? Thank's so much for sharing that. What about the multi armed ophiuroids of the Hunsruckschifer?